Image: IMDb, Amazon. Design: Ashley Britton/SheKnows. As we rapidly approach Oscar season, more of the new movies arriving in theatres deal with timely or discussion-worthy themes and stories. One of those movies is The Front Runner, which follows 1988 Democratic nominee Gary Hart (Hugh Jackman) and the cheating scandal that brought down his presidential campaign. Although Hart was considered the leading candidate at the time, his career was derailed when allegations that he was having an extramarital affair came to light, as he had positioned himself as a family man. The movie also digs into the way the media dealt with the allegations against Hart and how the press and public opinion shape narratives. 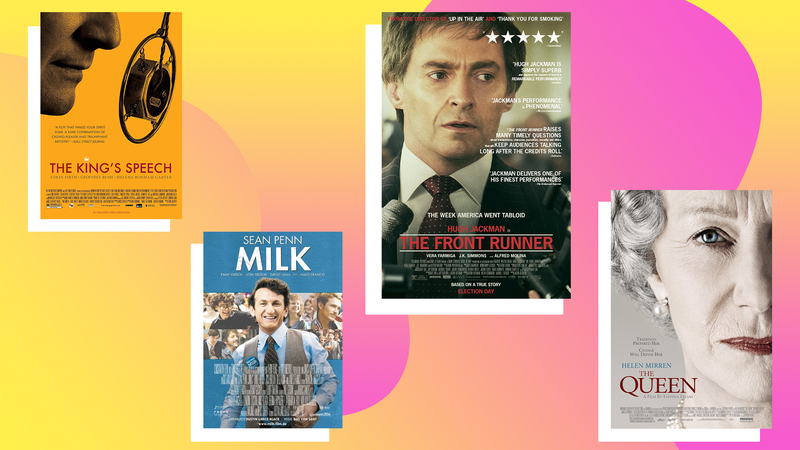 While The Front Runner is sure to be on the Oscar shortlist for 2018 because of the story at the heart of this must-see political biopic, we know that it’s not the only one you should check out. In that spirit, if you want to get in the mood for more drama-driven political biopics in the vein of The Front Runner, here are a few recommendations. It’s been a few years since this movie premiered, but don’t be thrown off by that. Gandhi remains a masterpiece. Following the story of Mahatma Gandhi as he worked to win independence for the Indian people, the story celebrates the impact of nonviolence even as it portrays its high price. The movie follows Gandhi from South Africa, where he won better rights for Indians, back to his native India, which was under British rule. Through the largest nonviolent protest in history, Gandhi’s work was able to pressure Britain to grant India independence. The nation was still in conflict, however, this time over religious differences, and the movie explains the creation of Pakistan as a separate Muslim state. At the time, Gandhi’s influence on global politics was unprecedented and irreplaceable. Years later, his story remains as remarkable and necessary as ever. Few biopics are as touching as this story of King George VI learning to overcome his stammer with the help of a brilliant Australian teacher. It won four Oscar awards, including best picture, original screenplay, actor and director, and Colin Firth’s portrayal of King George throughout is considered masterful. Covering the period of time when England was approaching World War II, the story comprehensively and gracefully handled both personal and political topics. As Roger Ebert pointed out in his four-star review, what lent such gravitas to the story was the sheer size of the British empire at the time of King George’s ascension. Nearly a quarter of the world’s population would have tuned in to hear the speech for which King George was preparing, so pressure on the monarch was intense. This biopic is one of the most personally compelling. Though Lincoln is only about a portion of President Abraham Lincoln’s life, the time period it encapsulates was one of the most important in American history. Through Daniel Day-Lewis’s portrayal of the 16th president, viewers are given a firm grasp of the man’s political genius and the opposing forces he governed during the nation’s greatest division. Following Lincoln through the end of the Civil War, the film tells the story of the battle to ratify the 13th amendment, abolishing slavery. Lincoln was unwavering in his belief that the measure needed to be passed before the Southern states surrendered, and the movie showed his work to see that accomplished while still maintaining his personal integrity. Lincoln was nominated for 12 Academy Awards, including best picture and best director. It won Oscars for best production design and best actor for Daniel Day-Lewis. Delving into one of the conspiracy theories that surround the assassination of JFK, Oliver Stone’s movie version of the tale effectively implicated people far and wide (including the military-industrial complex). In its review, The Hollywood Reporter said, “If any cause or special interest group wanted to hire a filmmaker to document the rightness of their issue, Stone would be unbeatable.” The writer/director framed his story around New Orleans District Attorney Jim Garrison, who built a case that challenged the lone gunman theory published in the Warren Commission’s report. Kevin Costner, at the peak of his popularity in 1991, nailed the role of Garrison casting doubt on the government’s official stance. The movie was rewarded with eight Oscar nominations, including best picture and best actor in a supporting role for Tommy Lee Jones. Though it missed out on the big awards, it did win for best cinematography and editing. Though Helen Mirren was a superstar long before her role as Queen Elizabeth II, this portrayal garnered her an Oscar for best actress and reminded fans why she is so beloved. She perfectly captured the queen coming to grips with the way the world had changed during her reign and the complex role of public opinion in political decisions. With a storyline that focused on the royals and Prime Minister Tony Blair (Martin Sheen) in the wake of Diana Spencer’s death, the movie didn’t flinch away from criticizing Britain’s leadership. At the same time, it generously handled the tension between tradition and progress. On the surface, this could look like a sports drama, but Invictus dug deeper to tell the story of a nation torn apart by decades of apartheid and Nelson Mandela’s hard work toward healing. Following the story of the 1995 Rugby World Cup, held in South Africa, director Clint Eastwood combined the rousing energy of the sports genre with the complicated, tragic history of a nation. The film shows Mandela’s plan to unite South Africa around the Springboks, the mostly white rugby team that, to the majority Black population, represented all that had been wrong with the country. Both leads — Morgan Freeman as Mandela and Matt Damon as Springbok captain François Pienaar — were nominated for Academy Awards for their work.